Home of the IMS: I call shotgun! First the Tauntaun sleeping bag.. and now a Power Wheels modded into a Warthog? Man I wish a was a child again. Apparently there is a whole community out there "tricking" these machines out, I bet they come up with some crazy customizations. 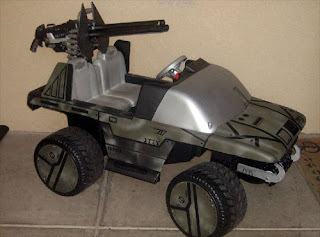 Check out the video below to see this "hog" in action... Hopefully it's not quite the deathtrap that it is in Halo 3.